With over 400 million netizens in India actively interacting with businesses online, it is no surprise that brands across industries are upping their digital game to engage and establish a personalized connect with the tech-savvy consumer. The Indian auto industry, however, has been slow to catch on to this trend. A new research report released by Facebook, in conjunction with Bain & Company, illustrates that auto OEMs (Original Equipment Manufacturers) in India are spending a mere 10–11% of their marketing budget on digital promotions, in spite of ~50% (~$18B) of current auto sales being digitally influenced. By 2020, 70% (~$40B) of auto sales are expected to be digitally influenced. The report elucidates that mobile is the dominant device of choice in over 80% of pre-purchase digital engagements for auto OEMs. Social media and search engines have emerged as the top digital channels and are each expected to influence over 40% (~23B) of auto sales in 2020. This new revelation is a wake-up call for auto OEMs to shift their traditional investment mentality onto digital platforms, as well as develop analytical capabilities to follow their customers online. By providing a single view of the customer’s online persona, digital can accurately help target micro-segments and segments of one with tailored marketing content, therefore predicting purchase patterns based on their persona. This will also spark a change in mindset for automobile dealers across India, with almost 50% of consumers making both brand and model choice before stepping into a dealership. Dealers will have to re-think their sales strategies from sending bulk SMSes, database calls, and print ads to more digitally-enabled channels such as online search and social media. Dealerships need to evolve into brand experience centres by using innovative store formats and leveraging new-age tech such as VR/AR, rather being just offering product information and test drives. Digital will increasingly influence post-purchase activities as well. The research stated that by 2020, over 40% consumers will use digital channels for vehicle service booking and almost 30% for purchase of accessories and spares, as compared to the present figures of 14% and 8% respectively. The emergence of connected vehicles provides auto OEMs with opportunities to provide value-added services such as smart service, emergency support, usage, and infotainment services which will help deepen customer relationships and advocacy. With the evolution of customer mobility mindsets and the emergence of the next generation of mobility models such as app-based cab services, profit pools for auto manufacturers are increasingly getting re-distributed. OEMs in India need to explore different parts of the value chain and establish unconventional partnerships while shifting away from their traditional core, to effectively tap into these opportunities. Facebook is one of the key players at the forefront of this revolution. It allows auto manufacturers to target and personalize their marketing efforts at scale. The social media giant claims to provide five per cent incremental reach over television at one-seventh the cost, which is an efficient way of providing additional reach to customers. In terms of consideration or purchase index, there is more than seven per cent boost over television at one-third the cost. Finally, with regard to sales, it is proven to have provided real-world outcomes for both online and offline brands. Auto OEMs and dealers need to understand and reflect on the importance of digital influence. 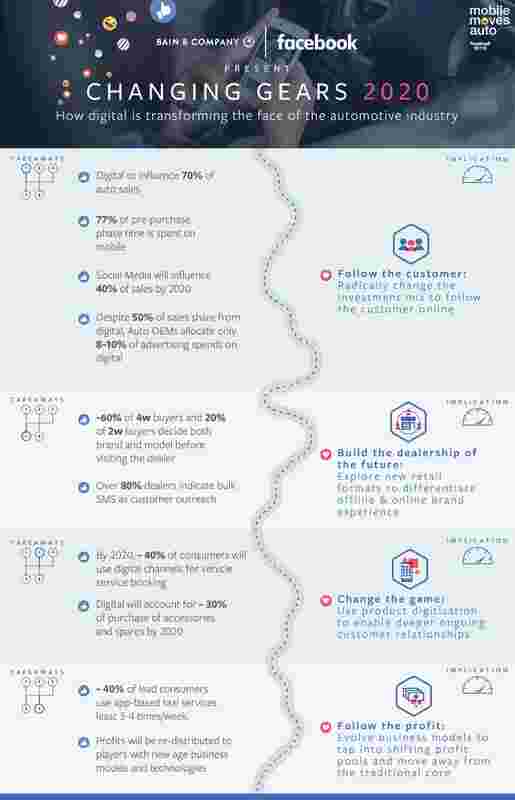 While creating positive digital influence is challenging and takes time, the multiplier impact it creates is reason enough for auto industry players to strategically harvest it to the hilt.